The car on the right is a cca 1901/2 Mors, distinguishable by having an offset cranking handle. Very many cars of the period looked very similar which makes precise identification quite difficult. We did however get this one early on. 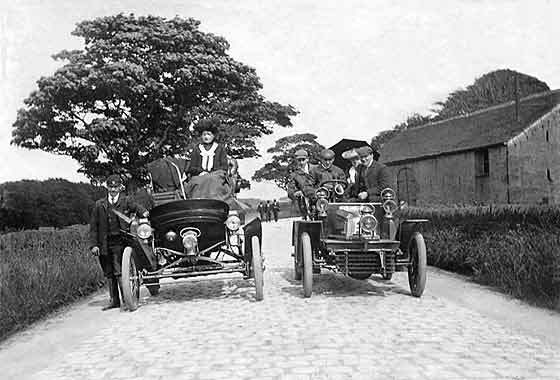 The more interesting tall black car on the left took quite a long time to identify and we even managed to get the picture printed in The Automobile. 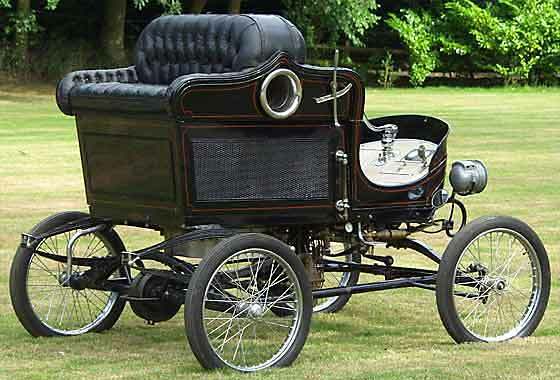 At about the same time our Desmond Peacock also identified the car as a turn-of-the-century "Toledo". 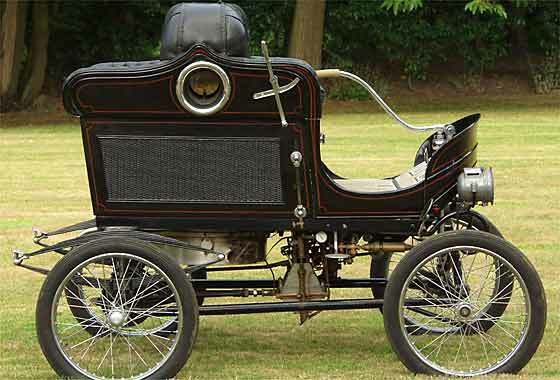 Further research defined that the car was manufactured by an American company called the American Bicycle Co., Automobile Department, in Toledo, Ohio. The car was steam powered and was called the Toledo Steamer. The Toledo Steamer was apparently manufactured only between 1900 and 1902. The company was later renamed International Motor Car Company, Toledo, Ohio, and some records have it as the Toledo Steamer Company. In any case, the company was closed down in 1902 when the Pope Company bought it and closed down all production of steamers. Thereafter the company was renamed Pope-Toledo and began manufacturing petrol driven cars. The Pope Company had simultaneously numerous other car companies including one manufacturing electric vehicles. The Pope Company went bankrupt in 1907 and remained in arrears until it was purchased by The Overland Motor Company under John Willys in 1909. Willys paid off the debt and reorganized the company, forming the Willys-Overland Company, a firm that would later introduce the Jeep and the Wagoneer. Then Became Chrysler Corporation and is all now the DaimlerChrysler conglomerate including Daimler-Benz (Mercedes) and Mitsubishi. The Toledo Steamer was fitted with a vertical two cylinder double acting steam engine of 6.25HP. 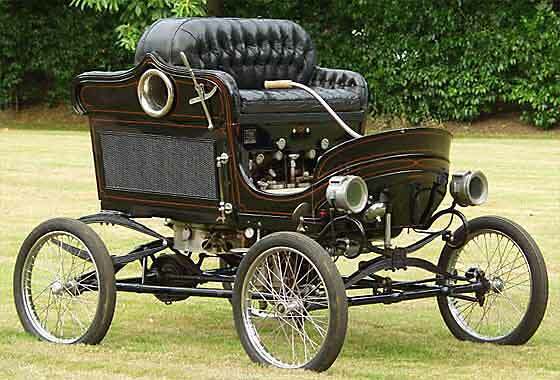 Steering is by tiller and various bodies were fitted, giving an overall cost between $800 an $1600 in 1902. A number of Toledo Steamers have survived including one in England which has been seen on the London to Brighton run. I had found some photos on a site where a Toledo Steamer was for sale for £55,000 (I think), but I have lost the URL to find it again and ask more. All photos below are from the internet with thanks to the owners in absence!